Thousands of people from around the country will gather in Eatonville, Florida on January 26, for the annual Zora! Festival, celebrating the life and work of African-American novelist and anthropologist Zora Neale Hurston. The celebration is an occasion to point out that Hurston should be remembered not only for her extraordinary literary and scholarly contributions, but also for her little-known role in the campaign to save Jews from the Holocaust. While Jewish participation in the black civil rights movement is well-known, few know of the support given by prominent African-Americans, including Hurston, to the 1940s Jewish causes of rescuing Jews from Hitler and creating a Jewish state. This other black-Jewish alliance was connected to a series of political action campaigns undertaken in the 1940s by a Zionist emissary from Jerusalem named Peter Bergson. When news of the Holocaust reached the West in 1942-1943, Bergson created the Emergency Committee to Save the Jewish People of Europe, to press the Roosevelt administration to rescue Jews from Hitler. By that time, it was already known that the Nazis had murdered over two million Jews–but millions more could still be saved. The Emergency Committee’s tactics included full-page newspaper ads, a dramatic pageant at Madison Square Garden, a march by over 400 rabbis to the White House, and a Congressional resolution urging creation of a U.S. government agency to rescue refugees. These efforts embarrassed the administration and compelled President Roosevelt to establish the War Refugee Board. During the final fifteen months of the war, the Board helped rescue over 200,000 Jewish refugees. Bergson’s efforts won the support of a wide array of prominent intellectuals, entertainers, Hollywood celebrities, and Members of Congress. Sympathy for the Bergson group crossed racial lines. Numerous prominent African-Americans were among its supporters, including labor union leader A. Philip Randolph; W.E.B. 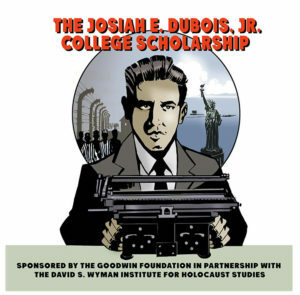 DuBois, the leading African-American intellectual of his era; and the famous black singer, actor, and political activist Paul Robeson, who was one of the stars of a Madison Square Garden show to raise funds for Bergson. Zora Neale Hurston and the renowned African-American author Langston Hughes were among the sponsors of Bergson’s July 1943 Emergency Conference to Save the Jewish People of Europe. The conference, which was held in New York City, was one of the most critical components of the rescue campaign. The Roosevelt administration had been refusing to aid the refugees, claiming there was no way to rescue them except by defeating the Germans on the battlefield. The Emergency Conference challenged that claim. More than 1,500 delegates listened to panels of experts on transportation, relief methods, military affairs, and other fields, discussing practical ways to save Jews from the Holocaust. The conference also demonstrated that rescue was not just a Jewish issue, but was strongly supported by a wide range of Americans. The co-chairs of the conference included conservatives such as former president Herbert Hoover and liberals such as American Labor Party leader Dean Alfange; Republican Senator Elbert Thomas as well as Democratic Senator Edwin Johnson; Roosevelt cabinet member Harold Ickes as well as Roosevelt’s arch-critic William Randolph Hearst. The speakers on the panels included prominent journalists, labor leaders, military personnel, the Presiding Bishop of the Episcopal Church, and NAACP director Walter White. A coalition this broad could not be easily ignored by the White House, especially on the eve of an election year. For Zora Neale Hurston and Langston Hughes to align themselves with the Holocaust rescue campaign took political courage. They were criticizing an administration that enjoyed overwhelming support in the African-American community. They risked endangering relations with FDR at a time when black leaders were pressing the administration on civil rights issues. Yet Hurston and Hughes refused to be silent when millions of Jews were being murdered. As we gather to honor the legacy of Zora Neale Hurston at this year’s festival, it is worth remembering that long before the civil rights alliance of the 1950s-1960s, African-Americans and Jewish Americans joined hands on behalf of rescuing Holocaust refugees and establishing a Jewish state. That, too, is a part of the Zora Neale Hurston story.